First Appearance: Sgt. Fury and His Howling Commandos (vol. 1) #1 (May 1963): "Seven Against the Nazis"
He'd lost Nick. "Sometimes I hope that God will one day decide that you can only shovel so much bullsh--," Nick said, "and then he's going to strike you dead." "He might," Tony said. "He just might. But before he does, let's go into another room where I've set up a little presentation..."
I got a guerrilla ant army out there, Nick thought, but no way to control it until Tony gets his voice of God networking thingamajig set up. Then again it wasn't like Banner was the only one whose character could be considered . . . murky. They all had secrets... Nick, our fixer, which of us will you throw under the bus the next time you need a favor from Capitol Hill? Banner's already gone. How long before you need another sacrificial lamb? It won't be me, Tony thought. Astonishing X-Men (vol. 3) #3 (Sep. 2004): "Gifted: Part Three"
Astonishing X-Men (vol. 3) #4 (Oct. 2004): "Gifted: Part Four"
Astonishing X-Men (vol. 3) #6 (Dec. 2004): "Gifted: Part Six"
Cable & Deadpool #11 (Mar. 2005): "Thirty Pieces, Part 1: Predator & Pray"
Captain America (Taco Bell Exclusive Collector Edition) #1 (Apr. 2009): "The Last Laugh"
Captain America (vol. 1) #142 (Oct. 1971): "And in the End..."
Captain America (vol. 1) #143 (Nov. 1971): "Power to the People!" Captain America (vol. 1) #144 (Dec. 1971): "HYDRA Over All!" Captain America (vol. 1) #146 (Feb. 1972): "Mission: Destroy the Femme Force!" Captain America (vol. 1) #148 (Apr. 1972): "The Big Sleep!" Captain America (vol. 1) #149 (May 1972): "All the Colors -- of Evil!" Captain America (vol. 1) #153 (Sep. 1972): "Captain America--Hero or Hoax?" Captain America (vol. 1) #166 (Oct. 1973): "Night of the Lurking Dead!" Captain America (vol. 1) #191 (Nov. 1975): "The Trial of the Falcon!" Captain America (vol. 1) #222 (June 1978): "Monumental Menace!" Captain America (vol. 1) #223 (July 1978): "Call Me Animus"
Captain America (vol. 1) #225 (Sep. 1978): "Devastation!" Captain America (vol. 1) #226 (Oct. 1978): "Am I Still Captain America?" Captain America (vol. 1) #227 (Nov. 1978): "This Deadly Gauntlet!" Captain America (vol. 1) #238 (Oct. 1979): "Snowfall Fury!" Captain America (vol. 1) #265 (Jan. 1982): "Thunderhead!" Captain America (vol. 1) #266 (Feb. 1982): "Flight from Thunderhead!" Captain America (vol. 1) #269 (May 1982): "A Mind is a Terrible Thing to Waste!" Captain America (vol. 1) #273 (Sep. 1982): "Cap and the Howlers Together Again!" Captain America (vol. 1) #274 (Oct. 1982): "Death of a Hero!" Captain America (vol. 1) #276 (Dec. 1982): "Turning Point!" Captain America (vol. 1) #279 (Mar. 1983): "Of Monsters and Men"
Captain America (vol. 1) #282 (June 1983): "On Your Belly You Shall Crawl, and Dust Shall You Eat!" Captain America (vol. 1) #283 (July 1983): "America the Cursed!" Captain America (vol. 1) #284 (Aug. 1983): "Diverging"
Captain America and the Falcon (vol. 1) #4 (Aug. 2004): "Mirrors"
Captain America and the Falcon (vol. 1) #6 (Oct. 2004): "Snapped"
Captain America and the Falcon (vol. 1) #9 (Jan. 2005): "Hunters"
Captain America and the Falcon (vol. 1) #11 (Mar. 2005): "I, MODOK"
Captain America: Sentinel of Liberty #6 (Feb. 1999): "Double Danger"
Daredevil & Captain America: Dead on Arrival #1 (Nov. 2008): "Dead on Arrival"
Daredevil (vol. 1) #73 (Feb. 1971): "Behold...the Brotherhood!" Daredevil (vol. 1) #120 (Apr. 1975): "...And a HYDRA New Year!" Daredevil (vol. 1) #121 (May 1975): "Foggy Nelson, Agent of S.H.I.E.L.D.!" Daredevil (vol. 1) #122 (June 1975): "H.Y.D.R.A. - and - Seek!" Daredevil (vol. 1) #123 (July 1975): "Holocaust in the Halls of HYDRA!" Daredevil (vol. 1) #187 (Oct. 1982): "Overkill"
Daredevil (vol. 1) #298 (Nov. 1991): "Turnabout"
Daredevil (vol. 1) #299 (Dec. 1991): "Regicide"
Daredevil (vol. 1) #321 (Oct. 1993): "Fall from Grace Part 2: Transgression"
Daredevil (vol. 1) #322 (Nov. 1993): "Fall from Grace, Part 3: Confrontation"
Daredevil (vol. 1) #344 (Sep. 1995): "Old Soldiers"
Daredevil Annual #10 (May 1994): "Dead End"
Deathlok (vol. 2) #17 (Nov. 1992): "Cyberwar, Part 1: The Search for Humanity"
Essential Spider-Woman #1 (21 Dec. 2005): "Dark Destiny!" Giant-Size Spider-Woman #1 (Sep. 2005): "Dark Destiny!" Hawkeye (vol. 4) #5 (Feb. 2013): "The Tape: 2 of 2"
Identity Disc #5 (Dec. 2004): "Identity Disc, Part 5"
Iron Man (vol. 1) #16 (Aug. 1969): "Of Beasts and Men!" Iron Man (vol. 1) #40 (Aug. 1971): "Nightwalk!" Iron Man (vol. 1) #117 (Dec. 1978): "The Spy Who Killed Me!" Iron Man (vol. 1) #119 (Feb. 1979): "No S.H.I.E.L.D. To Protect Me!" The Jack of Hearts #1 (Jan. 1984): "Murmer of the Heart..!" Marvel Fanfare (vol. 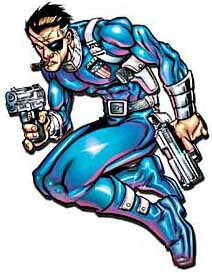 1) #41 (Dec. 1988): "Nick Fury"
Marvel Fanfare (vol. 1) #47 (Mid-Nov. 1989): "Renovation"
Marvel Spotlight (vol. 1) #32 (Feb. 1977): "Dark Destiny!" Marvel Team-Up (vol. 3) #6 (May 2005): "Golden Child: Part Six"
Marvel Two-in-One (vol. 1) #51 (May 1979): "Full House -- Dragons High!" Motormouth & Killpower #6 (Nov. 1992): "Pilgrims Progress"
Motormouth & Killpower #7 (Dec. 1992): "Return to Sender"
Nick Fury, Agent of SHIELD (vol. 2) #1 (Dec. 1983): "A Few Words About Jim Steranko"
Nick Fury, Agent of SHIELD (vol. 2) #2 (Jan. 1984): "Why I Failed to Become a Super-Star My First Year at Marvel"
Nova (vol. 1) #15 (Nov. 1977): "The Fury Before the Storm!" The Punisher (vol. 2) #41 (Oct. 1990): "Should a Gentleman Offer a Tiparello to a Lady?" Sgt. Fury & His Howling Commandos (vol. 2) #1 (July 2009): "Shotgun Opera!" Sgt. Fury and His Howling Commandos (vol. 1) #2 (July 1963): "Seven Doomed Men!" Sgt. Fury and His Howling Commandos (vol. 1) #3 (Sep. 1963): "Midnight on Massacre Mountain!" Sgt. Fury and His Howling Commandos (vol. 1) #4 (Nov. 1963): "Lord Ha-Ha's Last Laugh!" Sgt. Fury and His Howling Commandos (vol. 1) #5 (Jan. 1964): "At the Mercy of Baron Strucker"
Sgt. Fury and His Howling Commandos (vol. 1) #6 (Mar. 1964): "The Fangs of the Desert Fox!" Sgt. Fury and His Howling Commandos (vol. 1) #7 (May 1964): "The Court-Martial of Sgt. Fury"
Sgt. Fury and His Howling Commandos (vol. 1) #8 (July 1964): "The Death Ray of Dr. Zemo!" Sgt. Fury and His Howling Commandos (vol. 1) #9 (Aug. 1964): "Mission: Capture Adolf Hitler!" Sgt. Fury and His Howling Commandos (vol. 1) #11 (Oct. 1964): "The Crackdown of Capt. Flint!" Sgt. Fury and His Howling Commandos (vol. 1) #12 (Nov. 1964): "When a Howler Turns Traitor!" Sgt. Fury and His Howling Commandos (vol. 1) #13 (Dec. 1964): "Fighting Side-By-Side With... Captain America and Bucky!" Sgt. Fury and His Howling Commandos (vol. 1) #21 (Aug. 1965): "To Free a Hostage!" Sgt. Fury and His Howling Commandos (vol. 1) #22 (Sep. 1965): "Don't Turn Your Back on Bull McGiveney"
Sgt. Fury and His Howling Commandos (vol. 1) #23 (Oct. 1965): "The Man Who Failed!" Sgt. Fury and His Howling Commandos (vol. 1) #24 (Nov. 1965): "When the Howlers Hit the Home Front"
Sgt. Fury and His Howling Commandos (vol. 1) #25 (Dec. 1965): "Every Man My Enemy"
Sgt. Fury and His Howling Commandos (vol. 1) #26 (Jan. 1966): "Dum Dum Does It the Hard Way!" Sgt. Fury and His Howling Commandos (vol. 1) #27 (Feb. 1966): "Fury Fights Alone!" Sgt. Fury and His Howling Commandos (vol. 1) #28 (Mar. 1966): "Not a Man Shall Remain Alive!" Sgt. Fury and His Howling Commandos (vol. 1) #29 (Apr. 1966): "Armageddon!" Sgt. Fury and His Howling Commandos (vol. 1) #30 (May 1966): "Incident in Italy!" Sgt. Fury and His Howling Commandos (vol. 1) #31 (June 1966): "Into the Jaws of... Death!" Sgt. Fury and His Howling Commandos (vol. 1) #32 (July 1966): "A Traitor in Our Midsts!" Sgt. Fury and His Howling Commandos (vol. 1) #33 (Aug. 1966): "The Grandeur that Was Greece!" Sgt. Fury and His Howling Commandos (vol. 1) #34 (Sep. 1966): "The Origin of the Howlers!" Sgt. Fury and His Howling Commandos (vol. 1) #35 (Oct. 1966): "Berlin Breakout!" Sgt. Fury and His Howling Commandos (vol. 1) #36 (Nov. 1966): "My Brother, My Enemy!" Sgt. Fury and His Howling Commandos (vol. 1) #37 (Dec. 1966): "In the Desert to Die!" Sgt. Fury and His Howling Commandos (vol. 1) #38 (Jan. 1967): "This One's For Dino!" Sgt. Fury and His Howling Commandos (vol. 1) #39 (Feb. 1967): "Into the Fortress of...Fear!" Sgt. Fury and His Howling Commandos (vol. 1) #40 (Mar. 1967): "...That France Might Be Free!" Sgt. Fury and His Howling Commandos (vol. 1) #50 (Jan. 1968): "On the Beach Waits Death!" Sgt. Fury and His Howling Commandos (vol. 1) #51 (Feb. 1968): "The Assassin!" Sgt. Fury and His Howling Commandos (vol. 1) #52 (Mar. 1968): "Triumph at Treblinka!" Sgt. Fury and His Howling Commandos (vol. 1) #53 (Apr. 1968): "To the Bastions of Bavaria!" Sgt. Fury and His Howling Commandos (vol. 1) #54 (May 1968): "Izzy Shoots the Works!" Sgt. Fury and His Howling Commandos (vol. 1) #59 (Oct. 1968): "D-Day for Dum-Dum!" Sgt. Fury and His Howling Commandos (vol. 1) #60 (Nov. 1968): "The Court-Martial of Dum Dum Dugan!" Sgt. Fury and His Howling Commandos (vol. 1) #61 (Dec. 1968): "The Big Breakout!" Sgt. Fury and His Howling Commandos (vol. 1) #62 (Jan. 1969): "The Name is... Bass... Seargent Bass!" Sgt. Fury and His Howling Commandos (vol. 1) #63 (Feb. 1969): "To Die with Honor!" Sgt. Fury and His Howling Commandos (vol. 1) #64 (Mar. 1969): "The Peacemonger!" Sgt. Fury and His Howling Commandos (vol. 1) #65 (Apr. 1969): "Blood Is Thicker!" Sgt. Fury and His Howling Commandos (vol. 1) #66 (May 1969): "Liberty Rides the Underground!" Sgt. Fury and His Howling Commandos (vol. 1) #67 (June 1969): "With a Little Help from My Friends!" Sgt. Fury and His Howling Commandos (vol. 1) #69 (Aug. 1969): "Holocaust in Hell's Kitchen"
Sgt. Fury and His Howling Commandos (vol. 1) #70 (Sep. 1969): "The Missouri Marauders"
Sgt. Fury and His Howling Commandos (vol. 1) #71 (Oct. 1969): "Burn, Bridge, Burn"
Sgt. Fury and His Howling Commandos (vol. 1) #72 (Nov. 1969): "Play It Alone, Sam!" Sgt. Fury and His Howling Commandos (vol. 1) #73 (Dec. 1969): "When Two Worlds Collide!" Sgt. Fury and His Howling Commandos (vol. 1) #74 (Jan. 1970): "Each Man Alone!" Sgt. Fury and His Howling Commandos (vol. 1) #75 (Feb. 1970): "The Deserter!" Sgt. Fury and His Howling Commandos (vol. 1) #76 (Mar. 1970): "He Fought the Red Baron!" Sgt. Fury and His Howling Commandos (vol. 1) #77 (Apr. 1970): "Trapped by a Traitor!" Sgt. Fury and His Howling Commandos (vol. 1) #78 (May 1970): "Escape... or Die!" Sgt. Fury and His Howling Commandos (vol. 1) #79 (June 1970): "Death in the High Castle!" Sgt. Fury and His Howling Commandos (vol. 1) #80 (Sep. 1970): "To Free a Hostage!" Sgt. Fury and His Howling Commandos (vol. 1) #81 (Nov. 1970): "The All-American!" Sgt. Fury and His Howling Commandos (vol. 1) #82 (Dec. 1970): "When the Howlers Hit the Home Front"
Sgt. Fury and His Howling Commandos (vol. 1) #83 (Jan. 1971): "A Legend Called... Man Mountain McCoy!" Sgt. Fury and His Howling Commandos (vol. 1) #84 (Feb. 1971): "The Devil's Disciples!" Sgt. Fury and His Howling Commandos (vol. 1) #85 (Mar. 1971): "Every Man My Enemy"
Sgt. Fury and His Howling Commandos (vol. 1) #86 (Apr. 1971): "A Little Town in France..."
Sgt. Fury and His Howling Commandos (vol. 1) #87 (May 1971): "Dum Dum Does It the Hard Way!" Sgt. Fury and His Howling Commandos (vol. 1) #88 (June 1971): "Save the General, Win the War!" Sgt. Fury and His Howling Commandos (vol. 1) #89 (July 1971): "Fury Fights Alone!" Sgt. Fury and His Howling Commandos (vol. 1) #90 (Aug. 1971): "...And One Must Die!" Sgt. Fury and His Howling Commandos (vol. 1) #91 (Sep. 1971): "Not a Man Shall Remain Alive!" Sgt. Fury and His Howling Commandos (vol. 1) #92 (Oct. 1971): "Into the Jaws of... Death!" Sgt. Fury and His Howling Commandos (vol. 1) #93 (Nov. 1971): "A Traitor in Our Midsts!" Sgt. Fury and His Howling Commandos (vol. 1) #94 (Jan. 1972): "Who'll Stop the Rain?" Sgt. Fury and His Howling Commandos (vol. 1) #95 (Feb. 1972): "Seven Doomed Men!" Sgt. Fury and His Howling Commandos (vol. 1) #96 (Mar. 1972): "This Ravaged Land!" Sgt. Fury and His Howling Commandos (vol. 1) #97 (Apr. 1972): "...Till the Last Man Shall Fall!" Sgt. Fury and His Howling Commandos (vol. 1) #99 (June 1972): "The Grandeur that Was Greece!" Sgt. Fury and His Howling Commandos (vol. 1) #100 (July 1972): "One Hundredth Anniversary"
Sgt. Fury and His Howling Commandos (vol. 1) #101 (Aug. 1972): "The Origin of the Howlers!" Sgt. Fury and His Howling Commandos (vol. 1) #103 (Oct. 1972): "Berlin Breakout!" Sgt. Fury and His Howling Commandos (vol. 1) #104 (Nov. 1972): "The Tanks Are Coming!" Sgt. Fury and His Howling Commandos (vol. 1) #105 (Dec. 1972): "My Brother, My Enemy!" Sgt. Fury and His Howling Commandos (vol. 1) #106 (Jan. 1973): "The Last Prison Train!" Sgt. Fury and His Howling Commandos (vol. 1) #107 (Feb. 1973): "In the Desert to Die!" Sgt. Fury and His Howling Commandos (vol. 1) #108 (Mar. 1973): "Bury My Heart at Dresden!" Sgt. Fury and His Howling Commandos (vol. 1) #109 (Apr. 1973): "This One's For Dino!" Sgt. Fury and His Howling Commandos (vol. 1) #110 (May 1973): "The Reporter!" Sgt. Fury and His Howling Commandos (vol. 1) #111 (June 1973): "Into the Fortress of...Fear!" Sgt. Fury and His Howling Commandos (vol. 1) #112 (July 1973): "Into the Jaws of the Jungle"
Sgt. Fury and His Howling Commandos (vol. 1) #113 (Aug. 1973): "...That France Might Be Free!" Sgt. Fury and His Howling Commandos (vol. 1) #114 (Sep. 1973): "The Breakdown of Sgt. Fury!" Sgt. Fury and His Howling Commandos (vol. 1) #115 (Oct. 1973): "This One's For Fury!" Sgt. Fury and His Howling Commandos (vol. 1) #116 (Nov. 1973): "The End of the Road!" Sgt. Fury and His Howling Commandos (vol. 1) #117 (Jan. 1974): "Taps for a Drummer!" Sgt. Fury and His Howling Commandos (vol. 1) #118 (Mar. 1974): "The War Machine!" Sgt. Fury and His Howling Commandos (vol. 1) #119 (May 1974): "The Soldier Who Wouldn't Die!" Sgt. Fury and His Howling Commandos (vol. 1) #120 (July 1974): "Trapped in the Compound of Death!" Sgt. Fury and His Howling Commandos (vol. 1) #123 (Nov. 1974): "To Free a Hostage!" Sgt. Fury and His Howling Commandos (vol. 1) #124 (Jan. 1975): "Don't Turn Your Back on Bull McGiveney"
Sgt. Fury and His Howling Commandos (vol. 1) #125 (Mar. 1975): "The Man Who Failed!" Silver Sable and the Wild Pack #17 (Oct. 1993): "Enlightened Allies!!" Silver Sable and the Wild Pack #24 (May 1994): "Family Value"
Silver Sable and the Wild Pack #25 (June 1994): "Reunions"
Spider-Woman (Sep. 1979): "Dark Destiny!" Tales of Suspense (vol. 1) #92 (Aug. 1967): "Before My Eyes, Nick Fury Died!" Tales of Suspense (vol. 1) #95 (Nov. 1967): "A Time to Die -- A Time to Live!" Tales of Suspense (vol. 2) #1 (Jan. 1995): "Men and Machines"
Ultimate Captain America Annual #1 (Dec. 2008): "Favorite Son: The Origin of the Black Panther"
What If? (vol. 1) #28 (Aug. 1981): "Matt Murdock, Agent of...S.H.I.E.L.D." Wolverine (vol. 2) #42 (Late July 1991): "Papa Was a Rolling Stone!" Wolverine (vol. 2) #43 (Early Aug. 1991): "Under the Skin"
Wolverine (vol. 2) #163 (June 2001): "The Hunted: Part 2"
X-Force (vol. 1) #110 (Jan. 2001): "Rage War, Part One"
X-Men (vol. 2) #35 (Aug. 1994): "Sunset Grace"